The Celtic Sea is that section of the Atlantic off the south Irish Coast. The Irish Sea is the sea between Ireland and the UK. 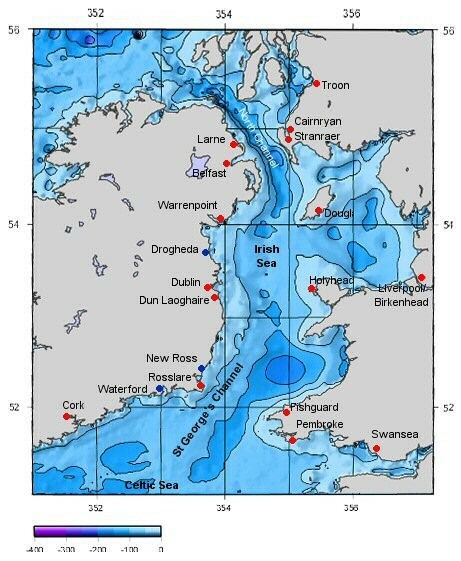 The Western Approaches is the large rectangular stretch of water south and west of Ireland and the UK, i.e. the Atlantic Isles, including these two seas. The term Western Approaches arose in the First World War and became better known in WWII as it was the Royal Navy’s designation for the area of intense sea-borne battles and loss particularly in the Merchant Navy. From a modern point the term is not used much anymore but familiar to those who “go down to the sea in ships”. The Irish Sea is defined by the IHO as On the North. The Southern limit of the Scottish Seas defined as “a line joining the South extreme of the Mull of Galloway (54°38’N) in Scotland and Ballyquintin Point (54°20’N) in Ireland“. On the South. A line joining St. David’s Head (51°54′N 5°19′W) to Carnsore Point (52°10′N 6°22′W). The western boundaries of the Celtic Sea are delimited by the edge of the Continental Shelf. The Irish Sea is cold, swarms with stinging Lion’s Mane and Portuguese Mar O’ War jellies AND the east coast of Ireland is rife with very strong sea currents, particularly up through St. George’s Channel around the South-east “corner” near where I am, but luckily starting further east, and also with an amphidrome near the Isle of Man, and with high traffic as there is no land bridge between Ireland and the UK. 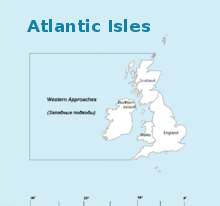 The Atlantic Isles rest on the European continental shelf, and the waters around are not very deep only going to about a hundred and fifty metres. In 2007 two trawlers, Honeydew II and Pere Charles were lost with seven hands within hours of each other, (and Damien Tiernan’s book on the tragedy, Souls of the Sea is a great, educational but bleak read).